All the haunting sounds of Halloween are pieced together in this house. A stool begins making noises, and then everything else joins in until the wind decides to join in and blows everything away. 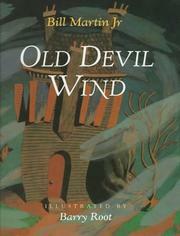 Martin, Bill Jr., “Old devil wind,” Children's Picture Book Database at Miami University, accessed April 24, 2019, https://dlp.lib.miamioh.edu/picturebook/items/show/9369.